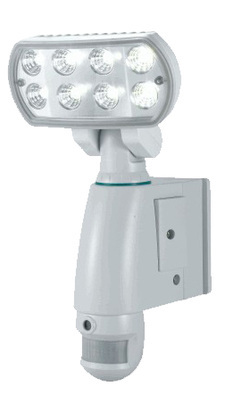 This Floodlight features ultrabright LED bulbs that activate with video and audio recording when motion is detected. It's a new twist on an old customer favorite. Recording is as easy as selecting the sensitivity, audio alert mode, and recording mode. You can set a time delay on the alarm if you wish. The video files are stored onto up to 2 GB SD cards; older footage is overwritten with newer footage in the event the SD card runs out of memory.